Hello! Yes, I am still alive! We welcomed our third daughter, Madelynn Jo Butler to the world on July 13th. Her delivery went smoothly and with little drama. And she is absolutely perfect. While I was pregnant, Stetson and I found it difficult to bond with Madelynn because we were so busy taking care of our big girls. We sort of forgot I was pregnant most of the time! However, after Madelynn was born, we spent three whole days in the hospital bonding with our new baby girl and it was glorious. The nurses kept asking us if we wanted to go home early since this was our third. Go home? 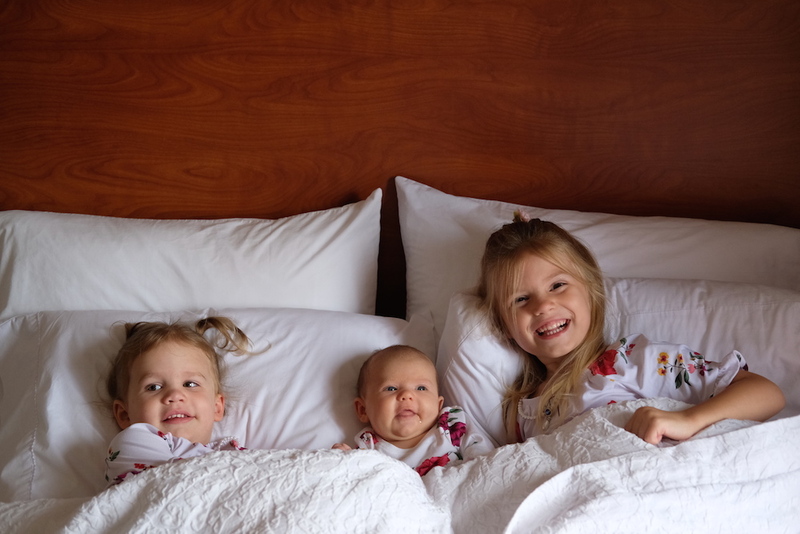 Back to the reality of caring for 3 baby girls with no room service or HGTV? Um, no thank you. We wanted to stay and savor the peace as long as possible. It was a sweet few days with our new babe but eventually the time came when we needed to re-enter the real world. I’m not going to lie… going from 2 to 3 is wild. We somehow felt like we went from 2 kids to 7. The big girls suddenly seemed louder, we felt much more exhausted, and we began to experience the cold hard truth that we were forever outnumbered. But with any big life transition, it takes time to settle into a new rhythm. And we are so thankful that God gave us Madelynn. It is hard to remember life before she came into it. I could write a book on the last three months but I think I will sum it up with a highlight, a lowlight, and something God has been teaching me in this new season. The best part of having more than one child is watching your big ones love on the little one. It makes my heart want to explode. Evelyn in particular has aggressively smothered her baby sister in love from the minute we brought her home from the hospital. When Penelope was born, Evelyn was still a bit too young to be helpful. However, this time around she really is helpful! She entertains her and is entertained by her. She watches her while I put Penny down for her naps. She tries to calm Madelynn when she is crying. Their love for each other is just the best. The first few weeks after Madelynn’s birth were probably the hardest parenting season we have faced yet. Not only were we struggling with newborn sleep (or lack of it), our house also got hit with Hand, Foot, and Mouth disease. Any parent who has faced it knows HF&M is of the devil. If you don’t know what HF&M is, whatever you do, don’t google it. Poor Penny got hit with it hard and was miserable, not to mention up every hour a night for about a week. And because we were giving so much attention to Madelynn and Penny, Evelyn began to act out with some crazy temper tantrums. Mommy and daddy may have had a few tantrums of our own. We were all a hot mess. Good times. Thankfully, our family and friends came to the rescue and helped us through that particularly rough patch. Three kids brought me to a place where I was desperate for the grace of God in a whole new way. My Pastor once defined grace as being “inclined to, favor, disposed toward, leaning towards.” I love that last little part of that definition – leaning towards. I don't know about you, but when life feels hard, there is really only one thing I want... I just want someone to be with me in it. I don't want someone to fix the situation. I don't want a pep talk. All I want is to be with me in the mess of it all. And because God is inclined to be gracious towards us, he promises to do this very thing. When life overwhelms us, God leans in. He steps right into the hard stuff in life by giving us his presence, his comfort, his people to care for us, and even some unexpected blessings like 2 babes napping at the same time. And oftentimes, we more clearly see His grace when we are most desperate for it. His grace has always been there but my eyes have now been opened more to it. When I am awake in the night with a crying baby and I somehow remember God’s presence with me – that is His grace. When I have supernatural strength to gently lean in towards my crying child instead of responding with anger, that is His grace. When I wake up in the middle of the night and realize that Madelynn has been sleeping for 7 hours straight, that is His grace. When a dear friend randomly drops off coffee and cookies to my house, that is His grace. Where do you see God’s grace in your life today? How is God leaning in to show you his favor? What little moments of grace have passed you by that you want to pause and thank him for? As for my writing, I am finishing up a few projects. There are some exciting things ahead! I also hope to blog more but we will see how it goes with 3 kids! Thanks for reading this update!